I wanted a place to put all of these so they were handy. Spartans, Your Profession Is "Loser"
"I'm very proud the way our football team handled themselves after the game as well. You don't have to disrespect people. We'll come to play. We don't have to be disrespected. We don't have to disrespect people. If they want to make a mockery of it, so be it. Their time will come." Indeed, Michigan State is truly the model for all those who would like to respect the game. This last is MSU's loser vigil after they blew last year's ND game at home. Notre Dame is a lot of things -- annoying, overrated, liable to lose to Navy at the drop of a hat -- but they aren't the flag planting types. "Let's put it this way, if anybody hadn't taken this personal up until this point, it's personal now," Hoyer said. "It just shows what kind of class he has. "Sooner or later, the little brother, you want to put us that way, you get pushed around enough, the little brother fights back and kicks the other brother's ***. Oh, now it's personal? You mean it's unlike all those other games when a host of kids who never even got looked at by Michigan (save three or four per year) played their instate rival and then immediately collapsed afterward? Oh ****. We are in serious trouble now. It's personal. I am liquidating my assets and moving to Tahiti, as Michigan will never beat Michigan State again. "It's [hatred of Michigan] inbred in me," Dantonio said. "It exists in me and everybody who's a true Spartan, not the ones who give their donor seats to Michigan Wolverines." I suppose I'm duty bound to give a reaction here, so here goes: OH MY GOD JLS HAS KILLED MARK DANTONIO AND IS WEARING HIS SKIN. IT'S GROSS! SO GROSSSSSS! Oh. Oh God. The dripping... the horrible dripping. Effluvia! But seriously folks, the one thing the Michigan State program needed was a monomaniacal focus on Michigan. It needed a coach who would install a countdown clock to their eighth straight loss in the series. It needed a man who would stand up and say "you know what, guys? All those other games we play are stupid and we shouldn't try very hard in them." It needed a guy who would teach his resilient troops to follow his example by bitching to the assembled media a full two days after his team blew it again. It needed a man who could forge them into a cohesive unit capable of picking up critical personal fouls at the very worst time possible. See, the problem with Michigan State is that occasionally they enter the fourth quarter of games leading. And Michigan State needs a man who can blow that lead, preferably in really, really painful fashion. Friends, Mark Dantonio is that man. I know, I know. You're probably wondering "what radical new direction will this knight errant take the hallowed Spartan program?" Well, let me tell you: every year Michigan State will jump out to a fast start by beating a bunch of awful nonconference teams. When they play at Notre Dame, they will win. Everyone will get all hyped up for the Michigan game, which they will lose. On the off chance they do not lose, they will arrange to lose to Indiana or Northwestern or some such team to restore the cosmic balance. After the Michigan game they will collapse wholesale. Sometimes they will go to a bowl in Detroit. Other times they will stay home and cry softly into their BEET MICHIGAN cardigans. They will never, ever go to the Rose Bowl, and every year MGoBlog will start its Michigan State preview the same way. Yes, friends, times are a-changin' in East Lansing. And another classic......Tidbit: The recruiting class being brutalized here went undefeated vs UM. A lot of inexplicable things have happened over the last couple days. Terrelle Pryor decided to not decide. Michigan stole commitments from Penn State, Purdue, and Florida. Sam McGuffie went on some sort of vision quest. (Fortunately, his totem animal is a wolverine.) And sooner or later Michigan will give a full ride to a long-snapper. 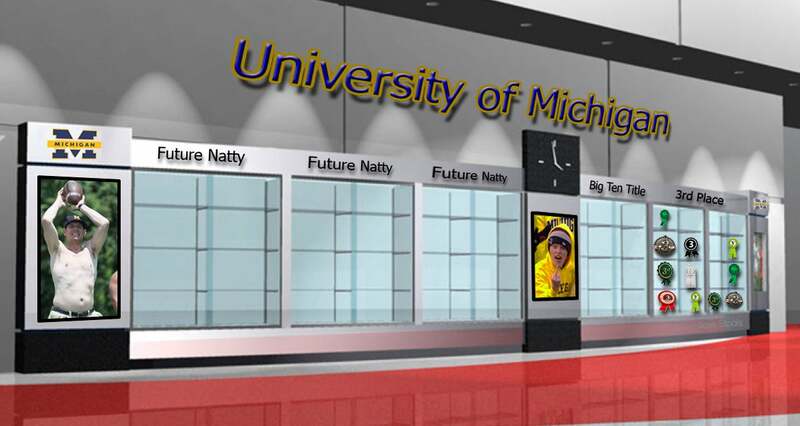 It's been the craziest Signing Day in the internet era of Michigan recruiting. Michigan State struck out on instaters Nick Perry (USC) and Mark Ingram (Alabama) late; Ingram's decision to flee is especially grating since his father was one of Michigan State's best wide receivers. Ohio linebacker Taylor Hill took an official visit to MSU and liked it so much he committed to Michigan on the way home. ****, linebacker Yourhighness Morgan took a look at MSU and said "thanks, but I'm going to play for Florida." MSU ranks 7th in the Big Ten, and this was both their new-coach-bump year and a year in which Michigan changed coaches. Michigan's little brother continues to bow down. If there was ever going to be a year in which Michigan State wrested instate recruiting from Michigan, this would be it. The results are Fred Smith and, depending on who you listen to, Tyler Hoover. Though Hoover claimed a Michigan offer, he ended up ranked a three-star at both sites. If he was part of the Michigan class, he would be the at best the #18 recruit in it. This is MSU's silver medal recruit. By any standard this is an immensely disappointing class... unless you're in the media. As things stood through Tuesday, MSU ranks in the bottom half -- as low as ninth by Scout.com -- of the Big Ten. However, that should not be interpreted as an indictment on the overall quality of the players coming in, according to CSTV recruiting analyst Tom Lemming. Sure. The fact that this is a class on par with Northwestern's shouldn't be interpreted as an indictment of the players' quality, just their ability to play football. Which they have none of. Ray, who committed early, joins a full stable of running backs that returns senior starter Javon Ringer, junior A.J. Jimmerson, Andre Anderson and Ashton Leggett from last year's recruit class. The addition of Ray allowed MSU to make four-star running back Mark Ingram Jr., of Flint Southwestern, less of a priority even though he was rated higher. Yes, the reason they didn't get Ingram Jr. -- remember Ingram Sr was a star for MSU -- was because they snatched Caulton Ray away from the MAC. Meanwhile, Ingram is part of the #1 recruiting class in the country. National signing day turned out to be a day of bold statements at Michigan State, including the one Mark Dantonio made to one of his top recruits, Charles Burrell, on Wednesday morning. "Look down at your feet," Dantonio said to Burrell, a safety from Detroit. "Now you just imagine those feet playing in the Rose Bowl, because that's where they'll be within four or five years." Tim Brewster, meet Mark Dantonio. You're both bats. Except you can recruit, Brewster. "They basically battled to a draw with (U-M) on in-state guys, which is big," said CSTV recruiting analyst Tom Lemming. In-state recruits with M and MSU offers who went to M: 5, including three of the top four kids in the state. The reverse: 2. "I know a lot of people nationally don't think this class stacks up with a lot of classes in the Big Ten [including me], but I think it does [except I don't]," said Jeremy Crabtree of Rivals.com, which ranks MSU's class No. 7 in the Big Ten and No. 47 in the nation [see?]. "They got a lot of the best kids from Michigan [that no other Big Ten teams wanted]. Any class that has (Detroit receiver) Fred Smith in it, I'm a fan of. If anything, this class could have used a couple more home runs [good players]." MSU thinks it got three from its back yard in Smith, Hoover and Burrell. They helped MSU compete closely with U-M for in-state talent, for the first time in recent memory. Asked how the Spartans did against the Wolverines, Dantonio stuck with the tone of the day. Bold. Indeed, "compete closely" now means pick up one guy Michigan wanted, one other they were kinda lukewarm on, and none of the top four guys in the state. This is expected from Lansing party organs. But what's the deal with Drew Sharp writing his bi-annual positive column about one of the worst recruiting classes in the Big Ten? And Mike Rosenberg trashing Rodriguez for "running off" malcontented, disrespected, and teammate-hated Ryan Mallett? A month after Mallett left, I've not forgotten what Rodriguez said about him. A reporter asked where Mallett was going. "I don't care," Rodriguez said. "He's not playing for Michigan. I'm concerned with who's playing for Michigan. ... I recruited him once, I recruited him twice, and after the third call, I'm thinking, 'OK, three calls is enough for me.' It's a great institution, and if somebody doesn't want to be here that's already here, you wish them well and move on." The problem is that Rodriguez didn't just say that to Mallett, or to the media. He acted like the wronged party, and he made a Michigan freshman look bad in the process. I do not understand the leap from "I tried three times and he does not want to be here, I wish him well" to "I am a wronged party! Mallett should look bad in your eyes!" You know who else was about to run off Ryan Mallett? Saintly Lloyd Carr, who according to a source told him "I don't like anything about you" and then hurled transfer papers his way halfway through this season. Mallett almost transferred two seconds after he showed up on campus, then almost transferred the summer between his early enrollment and fall, and then actually did transfer as soon as Rodriguez was hired. There's a common thread here. It is not Rich Rodriguez. during the disastrous Wisconsin game, when Mario Manningham bitched him out on the sidelines, or during Mallett's disastrous stint in the Illinois game, when Carr bitched him out for two solid minutes. The situation here is precarious; without a major attitude adjustment things could be very sketchy at quarterback next year. I have heard it far and wide and so many times from so many sources that the conclusion is indisputable: Ryan Mallett is the reason Ryan Mallett transferred, no matter what Ryan Mallett's mom -- no doubt the least biased source around -- says. Mallett would be on his way to Arkansas and failure no matter who Michigan's coach is. Meanwhile... Drew Sharp. What can you say? There were no news conferences from attention-hungry teenagers announcing there wouldn't be a news conference. There were no last-minute decisions that left the recruiting-obsessed almost breathless in anticipation. "No one decided to go to Michigan State." There was little buzz surrounding Michigan State's fresh list of football signees because it's boring building a foundation. There's only one "four-star" player coming to MSU? Detroit Southeastern wide receiver Fred Smith. But the commitments don't seem to include the illogical reaches that defined many of John L. Smith's recruiting classes. This class looks more Big Ten than Mid-American Conference. MSU's 2008 class: #49 to Rivals. MSU under JLS: #16, #35, #33. For Michigan State, it's not about the number of four-star recruits it signs now, but the two- and three-star players that can help develop a sturdy program. That's the foundation from which championship seasons and Rose Bowl appearances are inevitably erected. That's how Jim Tressel did it in Columbus. Indeed. Tressel's second recruiting class: #5. A foundation of... uh... three five-star recruits and fourteen four-star recruits. Just like Michigan State's class. There are private whispers around East Lansing that Rich Rodriguez's radical transformation of Michigan football creates opportunities for the Spartans. While the new guy from West Virginia introduces himself to the local prep coaches, Dantonio is already in the door, gaining familiarity. Indeed, Rodriguez, who hopes to have a spring game at Ford Field and will invite every coach in the state to come to his frequent clinics and camps and finished his first recruiting class with a flourish, will have to fear Michigan State's insane short-joke-making curmudgeon. Because Jesus, man... they got a guy! This is what you need to know about Michigan State's class: its second-best guy would be Michigan's 18th, and this year is the first time in 40 years Michigan changed coaches. Meet the new boss, little brother. - "Mr. Slim, meet Mr. None"
Peters and the WRs will have to dramatically step up their games to have a chance of winning against Wisconsin. Ohio will once again deliver on its annual UM beat down. 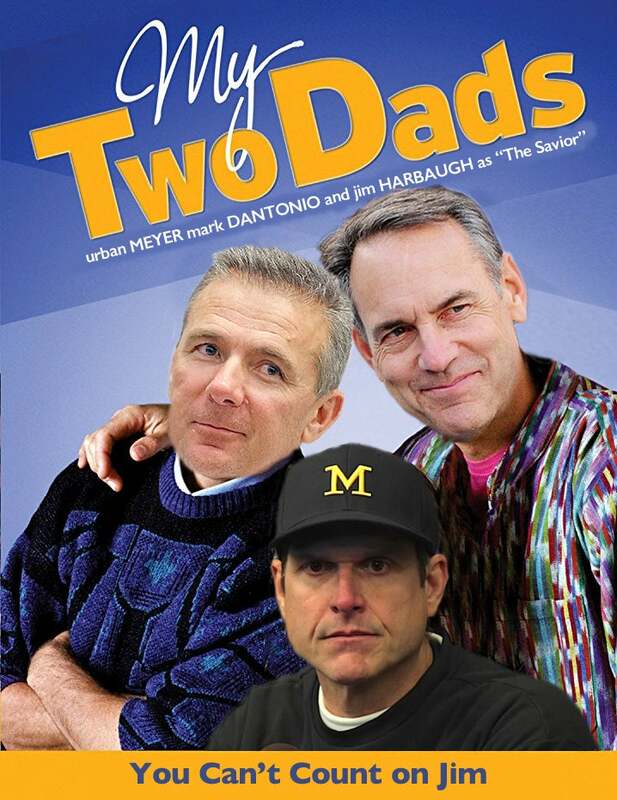 Meyer has Michigan's number, and Harbaugh's team still doesn't have the right mindset to truly compete with them. It's been 414 days since Michigan beat a team with a winning record. Well at least UM didn't finish 3rd again. - Navy and Air Force threw for more TDs this season than the QB Whisperer's team. - Maryland played 4 different QBs this season. Those 4 had a higher combined completion percentage than Jim's gunslingers. - Wake Forest had 76 more passing attempts (377 to 301) and gave up half as many sacks, all while not having a senior in their OL two-deep. - Only 4 Power-5 teams lost more yards to sacks. Save Illinois, each of these teams had at least 100 more pass attempts. This is very damning evidence that OL/QB development is lacking under Harbaugh, who was said to have been great in both areas. Sort of a rough tweet for a guy starting a felon at WR. A guy with 1 win vs his rivals. A guy with a poorer overall record. A guy with 0 wins over teams with winning records. Nine million dollars a year. 9 million for 8-4. What was Dantonio's first 3 year's record? Nothing for 4th in the division? The pettiness of this thread is something else, but blushes next to most UF-FSU threads. I guess the more NC a school wins, the bigger of an *** you're allowed to act like. In spite of not winning any NC in football, Sparty Nation is still trying to get to that level of *** and that is admirable. None? Since 1950 when MSU joined the B1GTen UM has won 1/2 a NC 1997. In the same time period MSU has won 2 - 1952 & 1965. For a school that won their last CONFERENCE title outright 15 years ago Michigan retains a huge opinion of themselves. They have yet to even APPEAR in a Championship game after 7 years having never won a DIVISIONAL title - MSU has been in 3. I got a good chuckle on MGoBlog the other day when a poster there called Tennessee fans "delusional" for thinking they could win a NC - not only have they won one more recently but again since 1950 they've won more. I know the wins over trade schools and high schools look good for the overall record but things aren't nearly as rosy when you talk the modern era of College Football - 1950 onward. How modern is 1950 IRT College Football? If you want to believe Nebraska got a share of that NC for any reason other than Osborne's retirement, have a good time. State fans are obsessed with the Michigan rivalry, and that's fine, but it pales in comparison To any of: Bama/Auburn, Bama/LSU, UF/UGA, UF/FSU or FSU/Miami. Having to go back over 50 years for an NC isn't something the schools down here do. Michigan and Michigan state would be .500 if they played in the SEC this year, and the fourth-best team in the state. Forgive me for not taking the MSU B1G title stuff seriously with Bama, Auburn and FSU winning recent NCs and UCF/Miami/USF losing just four games between them this year. Are State fans really that mad they can't play the fifth or sixth best team in the SEC on NYD? LOL. There have to be way better things to be angry about. Good on Tee Martin for winning that NC Manning never could. Manning couldn't beat Florida, either, and Tee also did that. You're really holding the fanbase hostage over someone with no respect for Tennessee football? I guess that guy wasn't at the Outback Bowl when Donte Stallworth and Kelley Washington beat Michigan into submission pretty much by themselves. Michigan football obviously has work to do, but I don't see any Michigan fans, coaches or covering media saying otherwise.